Liverpool's Mo Salah in action against West Ham on Monday. 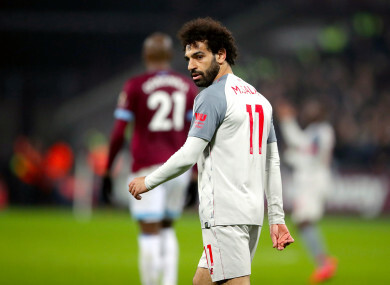 WEST HAM HAVE launched an investigation after social media footage emerged of abuse apparently being directed at Liverpool forward Mohamed Salah during a Premier League match at the London Stadium. The Egypt international was filmed on a mobile phone from a section of home supporters as he was taking a corner during Monday’s game. A West Ham spokesman said the club had “a zero-tolerance policy to any form of violent or abusive behaviour”. Police are reviewing the footage. Salah is the leading scorer in the Premier League in 2018/19, with 16 goals so far. Premier League leaders Liverpool drew the match with West Ham 1-1, frustrating their hopes of putting further pressure on rivals Manchester City in the race for the title. Email “West Ham launch investigation into alleged racist abuse of Liverpool's Salah”. Feedback on “West Ham launch investigation into alleged racist abuse of Liverpool's Salah”.